Last Saturday, Jolly Cow invited me and my darling #FabSkye for a fun Mom and Kids Day Out. We we're treated to an entire day of fun and bonding moments with our kids. I will talk about it in detail on my next posts. Anyway, as part of our fun Day Out, we watched the highly anticipated and most talked about Pixar movie of the year - Inside Out! I’ve heard a lot of raves about this film. Fellow mums are saying this is highly recommended. And I was told to bring a hanky ready. I’m glad I listened. 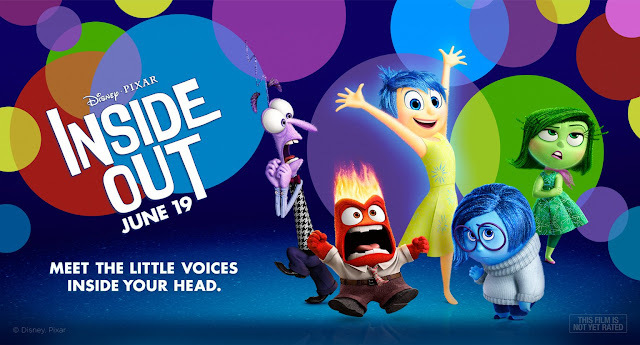 Inside Out is all about this little girl named Riley and her 5 emotions – Joy, Sadness, Anger, Fear and Disgust. It shows how each emotion takes over in helping build Riley’s personality and core emotions. It shows how each and every small detail in our kid’s life are stored in their vault of memories that in turn effects a part of their personality and their life in general. It shows how playing with your kids could in turn develop into this Goofball Island. And how hugging them could eventually lead to Family Island. How meeting a friend and playing with her could turn into Friendship Island and so on. How each island is important coz each is a part of Riley’s whole being. While my daughter was glued to the screen because of the colorful emotions and the character’s funny antics. While my daughter was enjoying every minute coz it’s another cartoon film that got her attention. I am glued because I can’t believe how much a simple film could affect me as a mother. I admit, I cried several times while watching. I cried when Bing Bong “vanished”. I cried when the command center shuts down leaving Riley emotionless. I cried when I saw anger took over one meal time. I initially cried when I saw that Riley’s mother’s command center was ruled by Sadness and her father’s was ruled by Anger. But then I smiled when I realized why Sadness rules the mum’s command center. I realized how real it was. That yeah. Sadness is indeed a mother’s ruling emotion. We are full of empathy, of compassion, we allow negative emotions so we could give attention to small details. I was awed by the beauty of it all. It made me realize that our emotions, though we could divide them into 5 major ones are very complex. Joy is not always fun and Sadness is not always bad. As a mother, I wish that I am helping my child build memories of Joy as a kid so she could use that later on in her life to achieve maturity. I could go on and on about my realizations but I might bore you to death. I highly recommend this movie to all parents. Watch it with an open mind and an open heart. And I hope it’ll help you with your parenting too. Now, I would always play with my Skye in the hopes that her Goofball Island is healthy and strong. I hug her often and say I Love You often to make sure that her Family Island is thriving. I am pretty sure that there’s a Minnie Mouse Island there too. And a Dancing Island. I know that someday, one of those islands would crash but I know that it’ll be replaced something else.